The book in one sentence: Love becomes one of the many casualties of war. 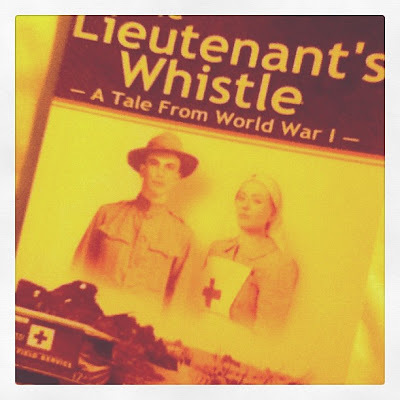 Synopsis of The Lieutenant's Whistle by Fred Stemme: Before America's entry into World War I, The American Field Service organized to help bleeding France. In thankfulness for France's aid during the Revolutionary War, young American males volunteered as ambulance drivers to repay their country's debt. Henry 'Hoop' Braddock is one such man. He and the boys of Section Two drive Model T ambulances, and are 'En Repos,' a unit awaiting assignment. One day, in a crowded, smoke-filled canteen in Bar-le-Duc, Hoop meets Kyla Laurens, a Scottish nurse. Her violet-colored eyes burn into his heart, branding him. As fate would have it, Hoop and Kyla end up serving at the same chateau-turned-hospital while the bloody battle to save Verdun ensues. At first, Hoop has precious little time to spend with Kyla due to the German attack. Instead, his time is spent driving his ambulance, all the while hearing the gruesome and touching detailed accounts of the fighting from injured soldiers riding in his cab. But later, once the pressure is off, a romance between Hoop and Kyla begins to flourish. Yet will experiences from Kyla's past prove fatal to their relationship? This is a love story that blossoms during a difficult time. On a deeper level, it is also a look into how war wounds go beyond the mere physical to the psychological. This historical fiction novel is set in picturesque France during the first World War, focusing on the saving of Verdun (check out the author's historical timeline for his novel here, 1916-1918). We join in the story as young American men volunteered to become ambulance drivers. We become privy to the story of one ambulance driver, Henry Braddock, a young idealistic man who was inspired by a rousing article by Theodore Roosevelt in Outlook (probaby very similar to this one). While many war stories tell of the travails of the soldiers, this one tells it from the viewpoint of those in the support groups of ambulance drivers, doctors and nurses from different nationalities coming together for a single cause. It is in a charged environment where life-and-death decisions become commonplace; where mundane, day-to-day routines heighten and make friendships, romances, and even the smallest acts of dedication and bravery even more meaningful. Such is the love story of Henry and Kyla. Although it starts out as a simple chance meeting, they can't forget each other and the fates smile on them time and again as they find themselves assigned to the same hospital. 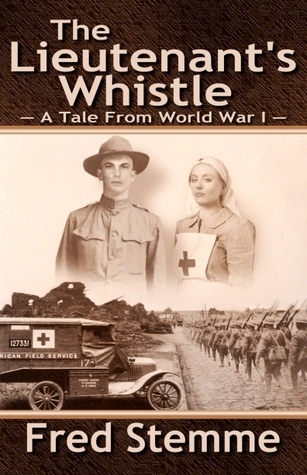 While Henry experiences the harrowing ordeal of driving a Model T ambulance to bring the wounded in, he comes to rely upon their small team. Being a reporter back home, he also writes about the various people he encounters and sends these stories back home, bringing an uncensored recounting of the war. Meanwhile, Kyla as a nurse, attends to suffering, wounded and dying men. In face of the pressing need for medical assistance, Kyla who was traumatized at an early age while assisting her father in surgery, also learns to face her demons. In the course of their duties, their paths cross with myriad other people, present in the hellish war for their own reasons. It is these vignettes of ordinary men and women in trying circumstances that make this book so rich in detail, able to hit close to home, and make this a truly compelling read. Star-crossed lovers, not. But the circumstances make loving difficult and the lovers end up separating. The book comes to a surprising clincher ... and you will have to read it to find out if they end up together. I enjoyed reading this book as it is a wonderful historical fiction piece which will got me thinking about and even researching about the War. The way this is written is simple and straightforward. Stemme doesn't like mincing his words and it has a conversational style that is not only accessible but very, very relatable. I imagined myself with my own grandfather, who, through many little chats, told me about his own experiences during the War (WWII). Stories interspersed with humour! Stemme also drew me in with his beautiful descriptions of the French countryside, Paris and the chateau-hospital. More importantly, he drew me in with the small details of the characters' lives. While this took place in 1916, it never felt dated as I was able to relate to the experiences and emotions of his characters -- everyday people who I kept thinking I could even know in real life. Again, I have to say something about the cover (you probably know I love my cover art), which I found slightly amateurish and overly literal in its concept and rendition. Verdict: A richly detailed, relatable love story. Vignettes of ordinary men and women in a hellish war make this a truly compelling read. First line: The railroad car swayed and the wheels clattered along the tracks. Last line: Arm in arm they walked out the door. I'm not one to read this type of historical fiction. I'm more of the Regency and Victorian era with all the lords and ladies. Just as well, good review. By the way, I nominated you for the Liebster Blog Award. See here. I like that type of historical fiction too! I am also a huge Philippa Gregory fan! Thanks for the nomination. That's so sweet of you!I got a previous nomination - you can check my answers here. This does sound interesting. I admit I wouldn't have picked it up based on the cover, but your review makes it much more compelling.